When I first started covering the environment for the Kitsap Sun in the early 1980s, I convinced a state fish biologist to make me a copy of a notebook containing information about salmon streams on the Kitsap Peninsula. 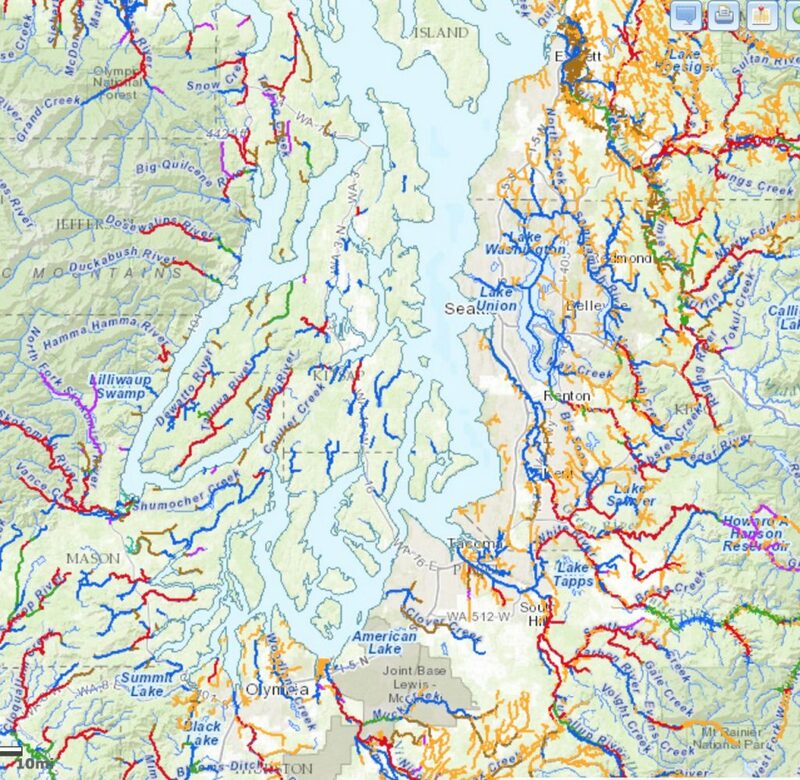 Winter steelhead streams in Puget Sound, as shown in SalmonScape, a GIS-based interactive map. Hand-drawn maps of streams, both big and small, along with field notes about the migration of salmon, stream blockages and other information were listed in that notebook. Through the years, the information was updated, combined with other data and eventually transferred to electronic databases for wider access. A few years ago, much of this little-known information was digitized into a map that could be accessed by anyone from a web browser. The map, using a geographic information system, is such a valuable tool that I wanted to make sure that readers of this blog are aware of it. It was given the name SalmonScape, and the map shows salmon streams across the state (click “hydrography”); salmon migration by species (“fish distribution”); stream blockages (“fish passage”); and hatcheries, fish traps and major dams (“facilities”). Well, we got it done, at least for now. I’m talking about a project that included a total of 27 new videos and an interactive map, all to help people observe the annual migration of chum salmon on the Kitsap Peninsula. This project is one reason I have not written as many stories or blog entries as I normally would have over the past few weeks. This is the fourth remake of the salmon map, going back to the first map published in the newspaper in 1995. This year, reporter Amy Phan produced the videos, adding many more location shots. We’ve also added an overview video describing the project and how to use the map (below). Because most of the filming was done before the rains arrived, streamflows in the videos are lower than what you will see if you go out now. If I had it to do again, I would have shot more video of salmon last fall. We’ll probably substitute some new shots of salmon in the streams. You’ll find my story about the beginning of salmon season in today’s Kitsap Sun. The web address for the salmon map is easy to remember: www.kitsapsun.com/salmon. Salmon-watching season may be somewhat shortened this year, but recent rains have encouraged large numbers of fish to swim into streams on the Kitsap Peninsula and probably elsewhere in Puget Sound. A coho salmon tries to leap into an outlet from the salmon-rearing ponds at Otto Jarstad Park in Gorst last week. It appears that coho and chum salmon were hanging out in saltwater waiting for adequate rains, which arrived last week. I covered the issue fairly extensively in a story in Friday’s Kitsap Sun. Normally, the peak of the chum salmon run occurs around Thanksgiving on the east side of the Kitsap Peninsula. Jon Oleyar, a biologist with the Suquamish Tribe, tells me that the salmon run is probably now on the decline, with dead and dying fish beginning to be seen today in larger numbers. For most of this week (at least after tomorrow night), the rains will probably hold off for awhile. Check out the forecast from the National Weather Service. Drier weather could help the streams run clearer. Salmon-watchers on the Kitsap Peninsula have seen a decline in coho in recent years, and biologists say it is probably because streamflows have become more “flashy.” More roads and other impervious surfaces carry water to the streams faster and allow for less infiltration. 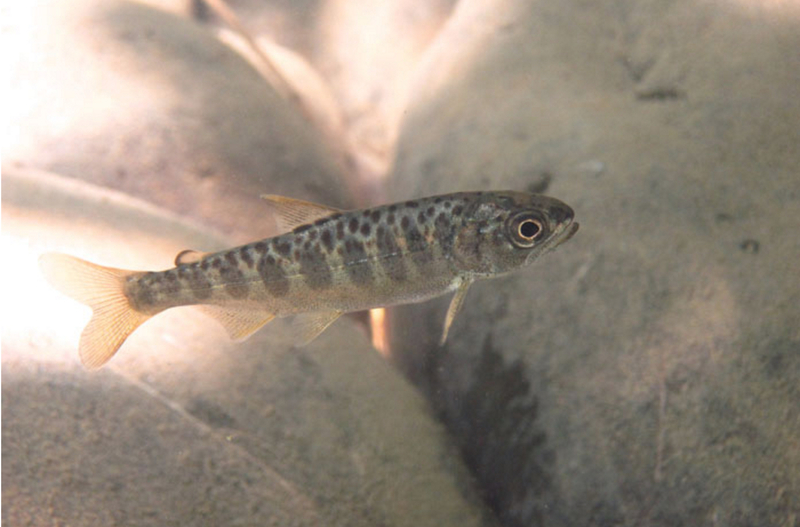 Losing infiltration means lower summer flows, which are important for coho, because coho remain in freshwater the first summer of their lives. Anyway, this year we’re seeing more coho in the local streams. Jon tells me they are mainly hatchery fish, probably strays from the Suquamish Tribe’s net pens in Agate Passage. 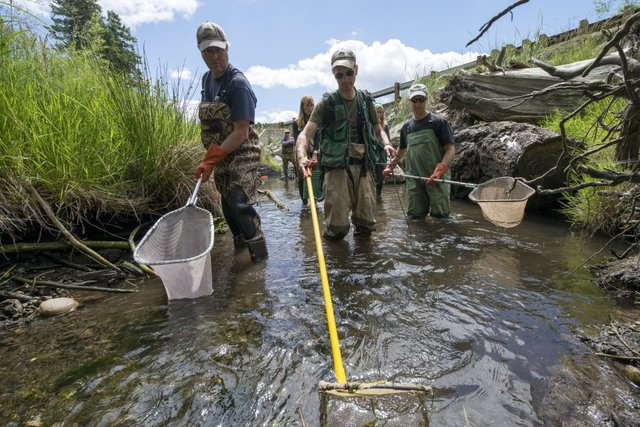 Those fish were meant to improve fishing for both tribal and sport fishers, but some got away. Whether the coho hatchery strays are beneficial or harmful to the wild runs remains a subject of debate. Some of the best salmon-viewing spots are shown on an interactive map that Angela Hiatt and I made four years ago. 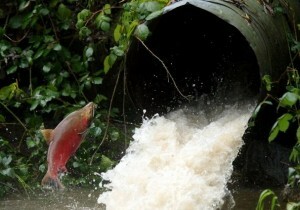 See Kitsap Salmon runs. If anyone knows of other good spots with public access, please share them in the comments section.